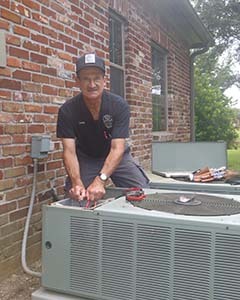 Louie’s A/C, Heating & Refrigeration Services, Inc. When the heating, cooling or refrigeration in your home stops performing at the level you expect of it, your quality of life is bound to suffer. Don’t let HVAC issues affect you in the place where you live—instead, contact Louie’s A/C, Heating & Refrigeration Services, Inc. to get the problem solved quickly and thoroughly! We fix just about anything having to do with your heating, cooling or refrigeration and we stock most of the parts required for repairs, cutting down on time spent working and getting you back to a superior standard of living faster! 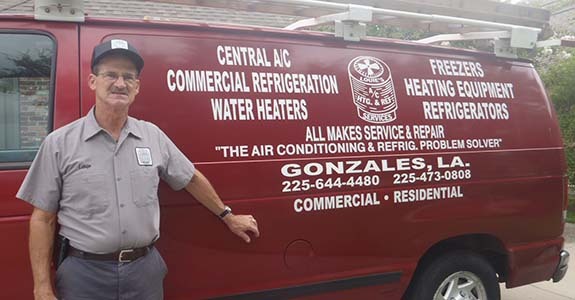 Whether it’s furnace service or refrigerator repair in Gonzales, LA, know that we’re here to help. We have our contractor’s license for the State of Louisiana (#45078). We’re locally-owned and –operated in Gonzales, LA. We have 98% of repair parts in stock and on hand, for quick and reliable repairs! We’re known as the refrigeration and A/C problem solvers! 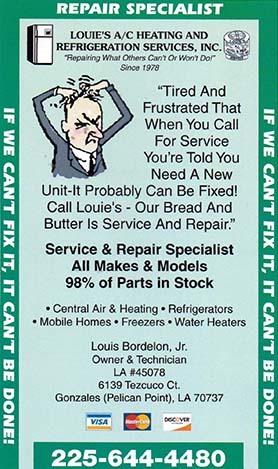 Louie’s A/C, Heating & Refrigeration Services, Inc. has 98% of the parts in stock for quicker repair service. 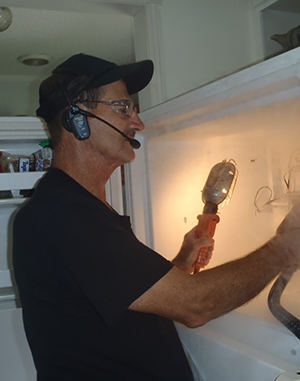 We offer a complete range of services, including hot water heater repair, refrigeration repair, air conditioning repair, freezer repair, GE/Hotpoint/RCA refrigerator repairs, central air conditioning repair, central heating repair, HVAC repair service, and MUCH more. If you’re having A/C, heating or refrigeration problems and need a reliable solution from trusted industry professionals, waste no time in contacting us today! We’re happy to provide you with a quote on service.